In the Harrogate shop we have over 200 ready to wear suits, in fabrics from Loro Piana, Vitale Barberis Canonico and fine English and Italian mills. 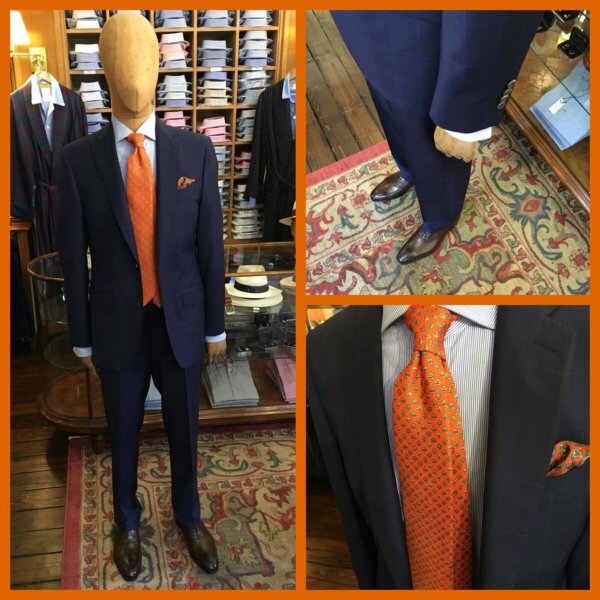 We have both full and half canvased suits, where the fit is sharp but comfortable and soft. 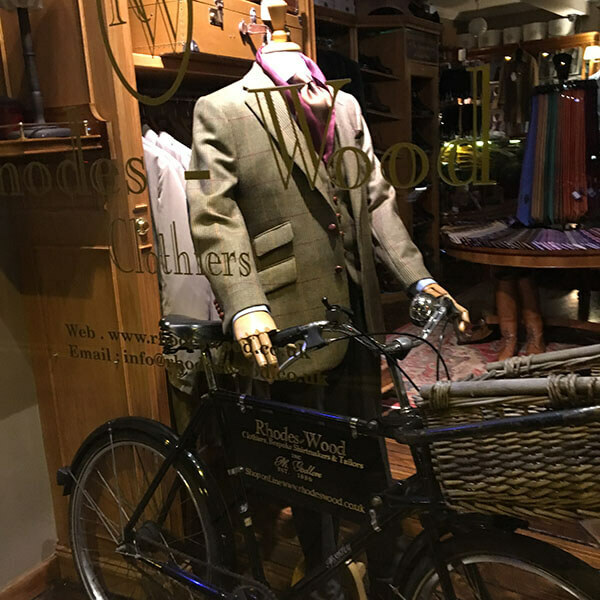 We stock sizes from 36 chest up to 52 chest in shorts, regular and long fittings and all our clothing is fitted to you and any re-tailoring is done here in Harrogate to ensure the optimum fit. We are sticklers for making sure things are done properly and will not cut corners. 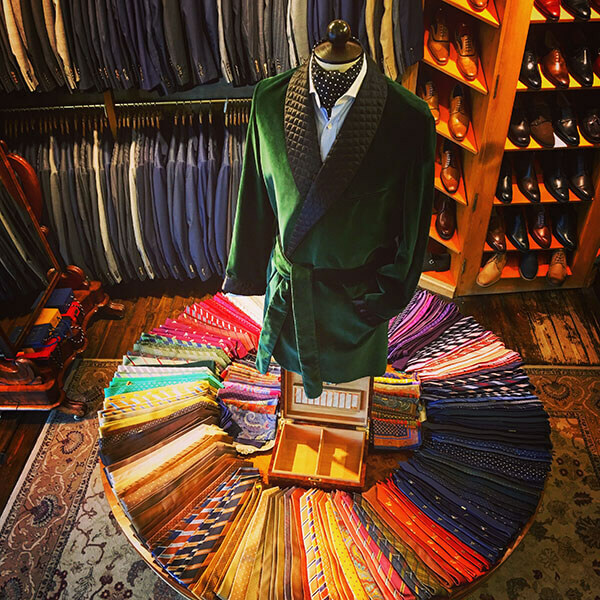 We keep a similar amount of sports jackets in stock in luxury fabrics, along with tailored trousers, blazers, evening suits, overcoats and rainwear. Our shirt department offers beautiful quality shirts that are made from fine 2-fold cottons. Some feature handmade shoulders, as well as many hand made points on the shirt. Our famous semi cutaway collar is as prevalent as it was when we started, but has been improved and developed over the years. To complement our range we have over 1000 silk ties in stock in fully hand made, hand made five and seven fold and our hand finished prestige range along with an enormous range of silk pocket squares, bow ties and cravats. Alongside this, we offer a full made-to-measure and bespoke tailoring and shirtmaking service. Jeremy also shoots and makes many shooting suits for fellow ‘keen shots’ and shooting estates. 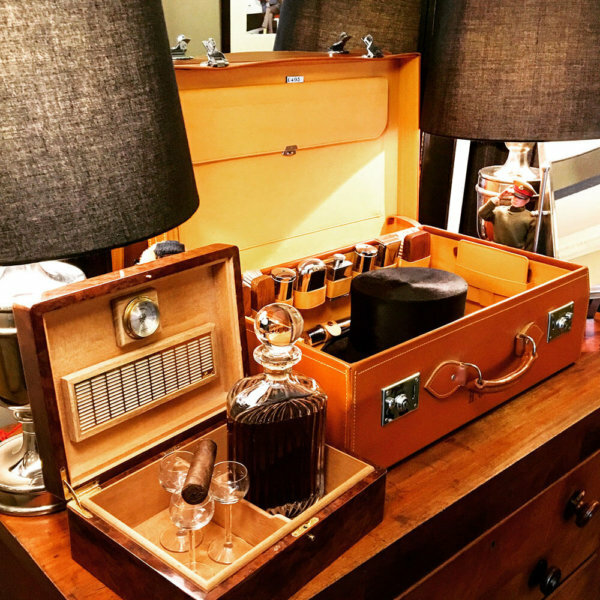 In July we opened a new London showroom based within 14 Grays Inn Road, near Chancery Lane, which runs by appointment only; please do contact us for an appointment via our contact us link or by email or telephone. Here you will find all our cloths and linings and a sample of our work on offer. 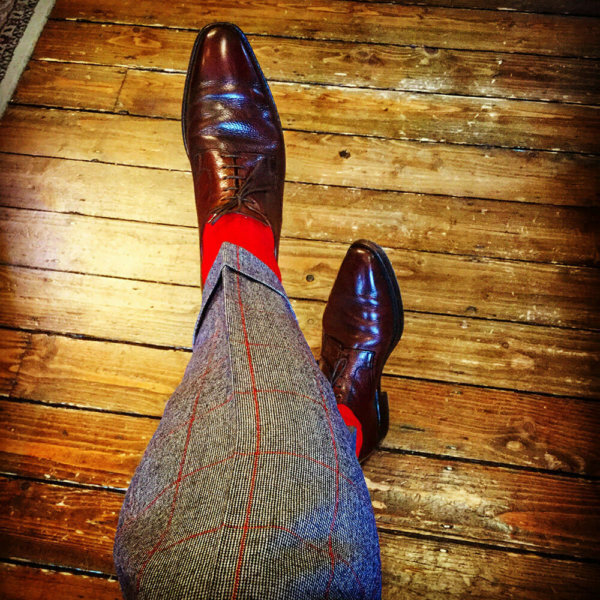 The shop in Harrogate also houses a shoe department, run as a concession by Christopher Forbes and we are all conversant with shoe measuring and fitting shoes by Crockett & Jones, Church, Cheaney, Trickers, Loake and Barkers. There’s nothing new about a denim shirt, but I’ve always loved them....here is our latest creation in super soft washed stretch chambray with tan buttons in a semi slim fit, show with a stretch beautiful quality chino from Incotex all by and for Rhodes-Wood, Harrogate.